We don't expect you to be experts. In fact, we expect that most of you are putting a podcast together for the first time. And even though this is a contest, it's also about learning new skills in a fun way. We want to make that learning easier — so we've put together a guide to help you along the way. Before we get started, we know you might have a few questions. Let's talk about a few basics. Podcasts come in all shapes and sizes. That's good news for you, because it means that you have lots of room to be creative and make something you're excited about. 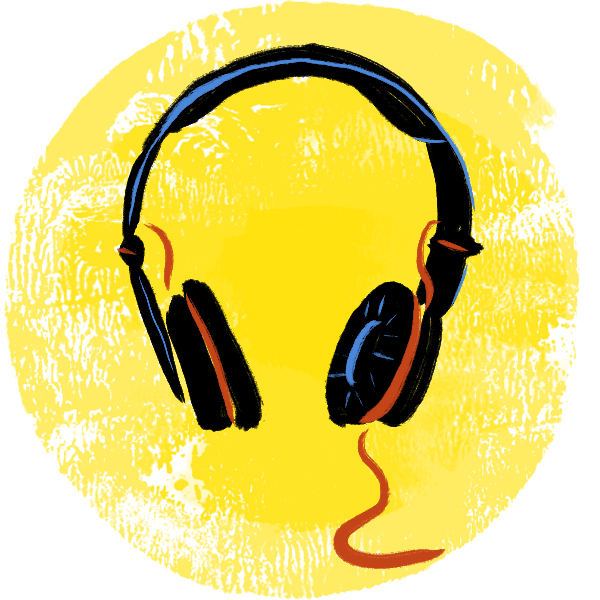 Some podcasts, like This American Life, are long — sometimes an hour or more. Others, like Kind World, a podcast from WBUR, are less than 10 minutes. Some podcasts, like NPR's Up First, are about news. Up First comes out every morning, and the hosts talk about the news and feature stories from guests reporting on the news. Other podcasts tell stories. Lots are funny. Some feature people having conversations. Many are educational: They teach listeners about a specific topic. NPR's Hidden Brain is about science and human behavior. And there's Planet Money, a podcast all about money and life. Think about sound. 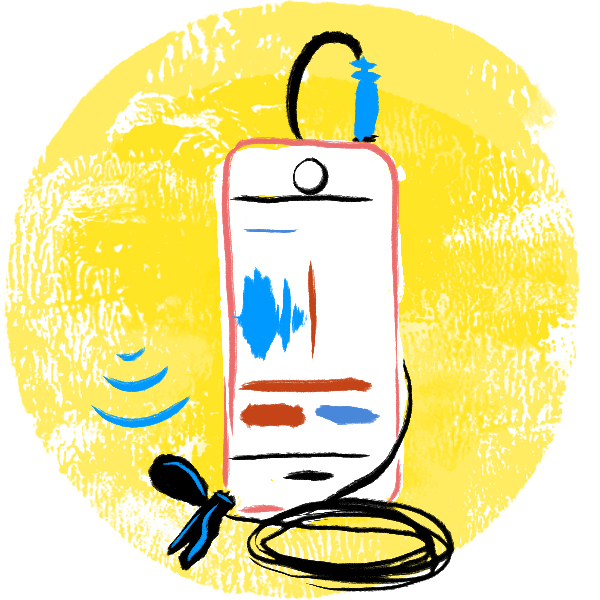 We're challenging you to work with sounds — interviews, narration and recorded sounds from the world around you. Don't I need fancy equipment to make a podcast? Nope! There are ways to make a podcast without buying expensive microphones and recorders. We're writing this guide with the idea that you can make a podcast with two tools: a smartphone and a computer. How many people do we need, and what roles are involved? There isn't a set number of people needed to create a podcast, but it helps to have a team of people who work in different roles. The role of producers frequently varies between podcasts and radio shows. Often, producers are in charge of the sound: They record the sound and edit it to put the podcast together. You'll also need writers to write out questions for interviews or the script. (Sometimes, producers or hosts pitch in to help write for podcasts.) Hosts also "voice" the podcast by acting as the narrator and conducting interviews with subjects. Depending on the size of your class or group, some team members may work as researchers or spend time organizing interviews. After you record the conversations or interviews, your team will want to make sure you talk about what you want to cut out and keep in — that's all part of the editing process. You might choose to have editors on your team or assign editing duties to teammates who have pitched in in other ways. You can divide up these duties in a way that makes sense for the size of your team. You might decide to have multiple people host and multiple people work as producers. What does it mean to mix audio? Mixing is the process of editing and arranging audio clips in a way that sounds seamless and natural to a listener. After you and your team record sounds from interviews, events or other sources, you'll need to arrange them in a sound-editing software, like Audacity, which you can download online free of charge. I've been reading lots of training guides that use tons of words I don't know. Help! 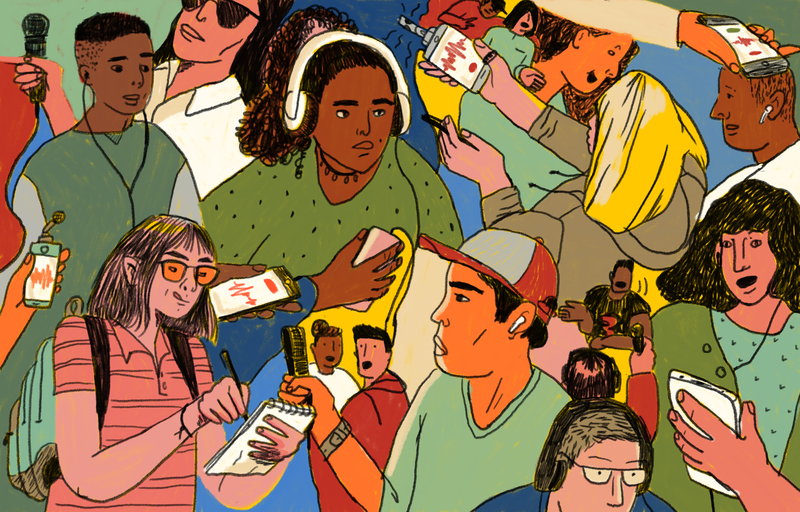 This glossary from NPR's training site has lots of words that you might come across if you're reading up on podcasting. 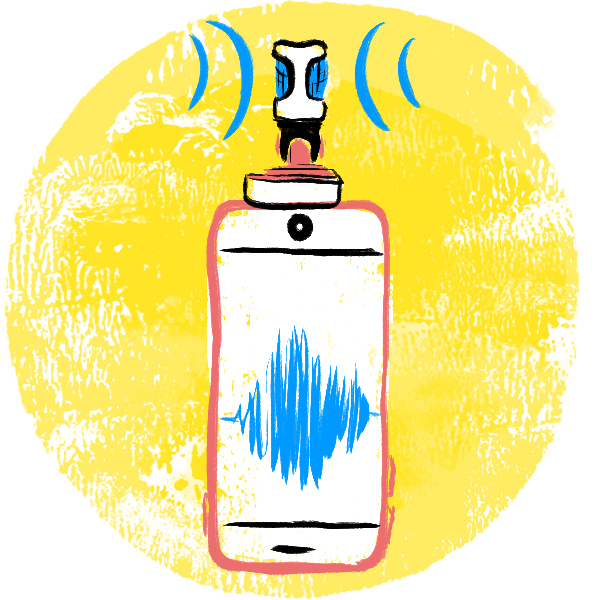 Before you think too much about your podcast, you're going to want to think about how, exactly, you'll record the sounds you need. Here at NPR, we use lots of equipment when we leave the office to record interviews or sounds for our stories and podcasts. But we don't expect you to have all that equipment — and you can make a podcast with a few basic tools that you already have. If you carry a cellphone with you, chances are, you've got a recording device in your pocket. And if you use it the right way, you can record high-quality sounds that work just fine for your podcast. You can record sounds, conversations or interviews with sound recording apps on your smartphone. You can also use your phone's built-in recording app. If you've got an iPhone, go to your "utilities" folder and click on "voice memos" to begin recording. You'll want to make sure you have enough storage on your phone to do this and that you can either email the sound file to yourself or plug your phone into the computer to upload the recording. If you're recording a person speaking, hold the phone a few inches from his or her mouth. Not too close, but not more than a few inches away, either. Once you've recorded your interviews or the sounds you want to use, you'll need to put them all together into your podcast. To do this, you need to use audio editing software to "mix" the sound files together. The good news is that there are lots of software options out there. If your school already provides editing software on the computers, feel free to use that. If not, we recommend Audacity, which is a free software download available online. You can download it here. As you learn to use it, lots of tutorials are available from Audacity. If your school or podcasting team has other tools available to use, it's important that you use them correctly to create the best product that you can. Have you ever listened to a podcast or radio show before? If you've listened to podcasts before — take a minute to think about them. What keeps you listening? What bores you? Let's take a few minutes to hear a few examples. As you listen, think about the different ways that these segments are structured. Is there a host? Is it an interview style — or is a narrator telling a story, with clips of interviews in between? Now that you've listened to a few examples, start to gather ideas. We've given you a few prompts to get you thinking. They aren't required, but you may choose to use them. Tell us a story about your school or community: about something that happened there — recently or in the past — that your audience should know about. Show us both sides of a debate about an issue that's important to you. What do you want to change about the world? What's a big change that students today will make in the future? Explain something to us that kids understand and grown-ups don't. Before you settle on one idea, take a few minutes to brainstorm. Try to come up with an idea that might work for each of these prompts. Be sure to think about how you might structure your podcast. Would it be an interview with someone? Would one host narrate the podcast, using clips of interviews to tell a story? What sound would you use to give listeners a full idea of the story you're telling? Is this podcast idea realistic? If the idea involves traveling somewhere far away or interviewing someone famous, it might be difficult. Make sure you can do it before you settle on one idea. Does the timeline work? Can you complete your interviews or record other sounds well before the podcasts are due — so that you have time to edit the audio and submit it? OK, so you've settled on a topic or idea for your podcast. Now it's time to start thinking about the sounds that you'll use. Regardless of how your project is structured, it helps to feature a variety of sounds. Try to record sounds relevant to your story. If I'm telling a story about the mayor of my town, I'll try to go record him leading a town hall meeting, talking to his constituents, and even doing day-to-day activities, that I can play during my podcast. Let's say you're heading to a protest in front of my local town hall. You're heading into a "scene" that you might want to describe — and include sound from — in your podcast. What sounds should you include? Compile a list of sounds you'd like to record — and bring that list with you when you go into the field. Here are a couple of examples of radio pieces that use sounds to add to the story. Listen to this "Radio Field Trip" from New Hampshire Public Radio. What sounds do you hear? There's narration from the show's host, Rick Ganley — but there's a lot more than that. And here's this one, from Radio Rookies, a series from WNYC. Listen to the sounds that Radio Rookie Edward uses and weaves between his narration. Now that you know what your podcast is going to be about, and you've got an idea of the sounds you want to use, it's time to think about structure. Before we start planning the podcast — before we get to scheduling interviews or scripting pieces — let's ask a few basic questions. Head to this link, from NPR's training site, and think about your answers. Of course, the structure of your podcast will depend on the idea you've chosen. 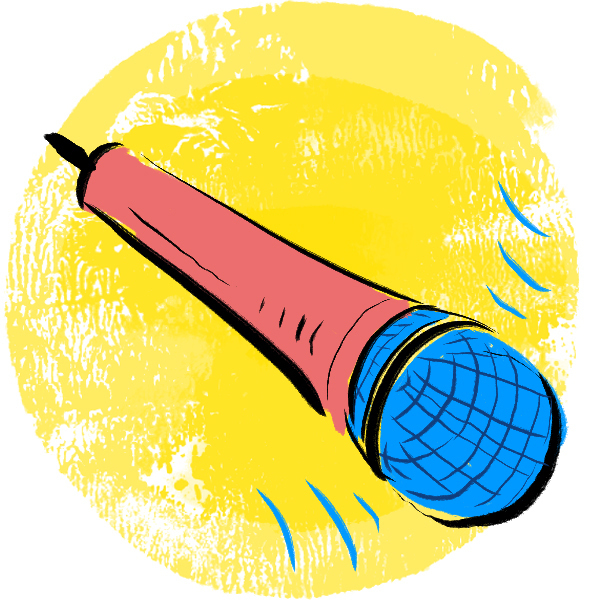 Will hosts from your class narrate the podcast? Then you'll start differently from the way you would have a conversation on tape. There's a good chance that you're interviewing someone for your podcast. Maybe you're even talking to lots of different people. It's important to make the most out of the time you take to record them. Make sure you understand why you're interviewing this person. Read up on who the person is, what he or she does, and the subject you're making a podcast about. Come up with a list of open-ended questions you'd like to ask during your interview. It's OK to veer off course and good to ask follow-up questions that you haven't planned. But a list will help get things started. Clarify the terms of the interview. Make sure your interviewee knows you're talking to him or her for the NPR Student Podcast Challenge. The person should understand that you're recording audio. Meet somewhere quiet (unless you want to record the noise!). Don't choose to meet for an interview in a busy mall or a windy park. If you're indoors, head to a quiet room and close the door. If you're interviewing someone at an event, it's OK if there's some noise in the background — as long as it's the sound you want to have in the background. But try to avoid recording when there's music in the background — it's hard to edit around that sound. Ask the interviewee to introduce himself or herself on tape. The person should give his or her name and job title (what he or she does). A student should give his or her age and grade. You'll want to hear these questions when you listen back to the tape later on. You'll have some questions prepared — but that doesn't mean you're following a script. If the person says something you're interested in, ask questions. That's why you're there. Remember: It's normal to be nervous. The person you're interviewing is probably nervous, too. It helps to be prepared. The better you know your questions and the better you know your equipment, the better you'll feel. Contact and reserve time to interview guests. Write out possible interview questions. Compile a list of sounds you'd like to include. Whether this is your first podcast or you're an audio pro, some basic tips can make your project a lot easier. Test your equipment before you start. Don't get stuck in an interview with a phone that doesn't have any storage or a microphone with no batteries. Bring a teammate along to help when you're going to an interview or to record sounds. Ask this person to time the interview and make a note of the interesting or compelling moments. Make a note of the time at these moments. This will help when you're cutting the audio and looking for these moments later. Listen to the audio soon after you record it. Save it somewhere you'll remember, and label it so you know exactly what your recording includes. Before you head out for an interview or sounds for your podcast, make sure you've got everything you need. Download a checklist for field recording here to take with you when you're getting ready to head out to record. At NPR, some podcasts are scripted. That means that we plan the order that everything will be in before the host gets into the recording studio and records the narration. That can happen only after getting "tape" — sound from lots of interviews and audio from other recordings. Let's take a look at the script of an audio segment. Here's one from the NPR Training team featuring a story from NPR's Ailsa Chang. There's not one correct way to write a script for a podcast — but it helps to indicate where your narrators will speak, and where you'll be using sounds or interview clips recorded beforehand, and how long these clips last. First things first. So, you've figured out how you want your podcast to be structured and you've gathered the sound you need. Whether you're scripting the entire podcast or not, you probably need to write out at least one part: the very beginning. Here's a post from NPR Training with some ideas about how to start, no matter how you're structuring your podcast. After you've scripted the podcast, it's time to record the narration from the host or hosts from your group or class. If you're hosting or narrating the podcast, you might be a little nervous about recording your voice. Mixing is the process of editing and arranging audio clips in a way that sounds seamless and natural to a listener. After you and your podcasting team record sounds from interviews, events or other sources, you'll need to arrange them in sound-editing software, like Audacity, which is available online as a free download. Don't leave audio mixing until the last minute. Mixing is time-consuming, especially if you're using new software or listening to long recordings. It can take many hours just to edit a few minutes of a podcast. Give yourself sufficient time to mix audio before you need to submit the podcast. Remember, the deadline for this contest is March 31. Take the mixing process step by step. Prioritize things you need to do to make your podcast sound the best it can. Before you can do anything else, you need to cut your sound down to the clips you need, get them in order and adjust their volume levels so they're not too loud or too soft in a listener's ears. These are all things you can do in any audio editing software. If you're already an audio mixing pro and you want some more guidance, check out this guide put together by Rob Byers of Minnesota Public Radio and NPR's training team.